We should have know what we were getting ourselves into when our waiter at Orleans (Davis Square) actually cautioned us that the Idaho Nachos came with an American cheese spread rather than traditional queso sauce. Usually we only expect puffer fish to come with a disclaimer, but apparently Orleans thinks these nachos are just as deadly. Probably because they have the nutritional information. Awhile back, we invented the life-shortening sodium spree known as The White Trash-os. Using Fritos, hot dogs, pork & beans, and jarred queso sauce, we assassinated our arteries while bringing back those oh-so-pleasant memories of family trips to the Ozarks. Orleans’ “Idaho Nachos” might be the slightly higher class version of those (and we really mean only slightly): potato chips, soaked with “an American cheese spread,” and drizzled with bacon bits, tomatoes, and green onions. Appearance: (8) Low-end never looked so haute cuisine! Beautifully plated in a large bowl with colorful confetti of garnishes, these caught us off guard with their loveliness. Quality of toppings: (3.5) We can’t legally give a score over 4 for any dish that has “an American cheese spread,” though since we were expecting it, the whole experience seemed marginally better. While we kind of like the understated quality of the sauce, it wasn’t strong enough to be the main feature of the dish and we really needed some other element to pump up the flavors and give us an experience other than salty. The bacon added a kick–a nice kick of carbon, as it was completely overcooked. All of that processed goodness left us fighting for the spare tomatoes and green onions on the plate. The real problem here, however, was the chips which were initially stale tasting and toward the end soggy and greasy. Not a good progression! Distribution of toppings: (6) Cheese sauce has notoriously good distribution, starting out on the top layer and slowly soaking its way to the bottom to fully coat everything. But even that couldn’t help the sad lack of toppings or central focus. Price: (9) Ah, Somerville…Leave the Boston/Cambridge area, and suddenly, a plate of nachos costs $8. What a cheesy, greasy steal! 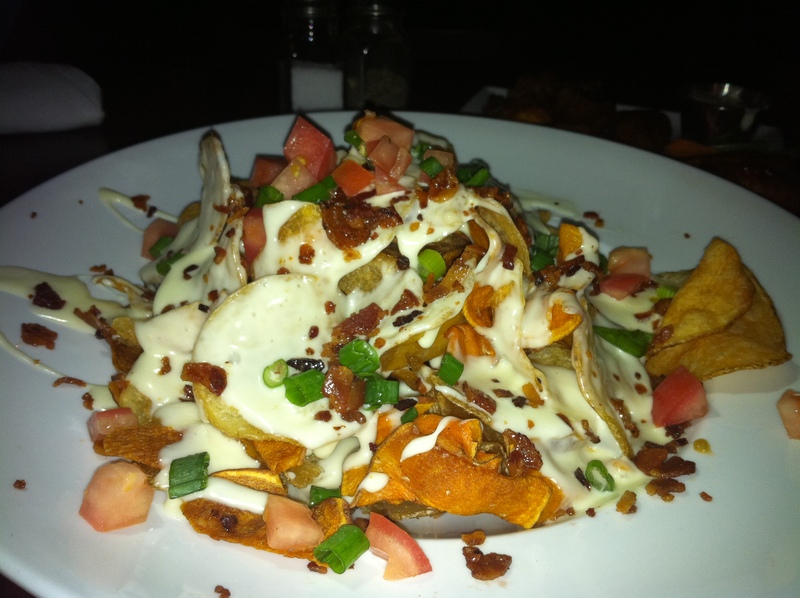 We appreciate a restaurant that will take a risk on a specialty nacho, but we probably won’t order these again. Idaho Nachos or Irish Nachos are a great idea, but this particular plate just wasn’t inspired. Give us one more strong ingredient that compliments the cheese sauce rather than puts it front-and-center, and we’ll talk again.